Written by 8/25/2009Share this story on Facebook! Consider majoring in the outdoors! Even the most studious collegiate needs to take a break, and Ithaca has some great spots to get away from it all. Check out these nearby parks the next time you need to chill out. 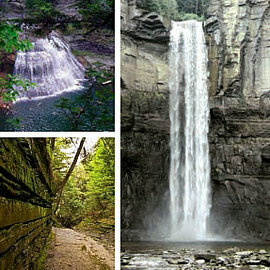 With its 10 waterfalls, Buttermilk is one of the most popular parks in New York State. This park has 12 waterfalls, miles of hiking, and a swimming area. Sorry Niagara, Taughannock Falls is the highest free-falling waterfall in the northeastern United States. Beautiful Six Mile Creek is within walking distance from IC and Cornell University. Just 30 miles west of Ithaca, this park has amazing views of 19 waterfalls, carved tunnels, bridges, and sculpted walkways. Learn more about these, and other parks on the New York State Office of Parks, Recreation, and Historic Preservation website (select the Finger Lakes region).